Queen's first studio album of new material in 13 years continues their legacy with Rodgers adding a bluesy-er element to Queen's awesome majesty. How do you replace the irreplaceable? The answer is... You don't. When Freddie Mercury passed away in 1991, Queen lost their magnetic frontman and the world lost one of its greatest, most versatile vocalists of all time. Although Mercury was an integral part of the band, three talented musicians remained. Taking to heart the words of one of their songs: "The Show Must Go On". And so it did. Brian May, Roger Taylor, and John Deacon continued playing together under the banner of Queen at awards shows and charity events. Filling the empty spaces with a revolving cast of guest vocalists and performers including Robbie Williams and Elton John, Queen still lived on, insofar as playing their classic material in a live setting or re-interpreting it for collaborative efforts. In 2004, Brian May informally jammed with Paul Rodgers, formerly of British blues-rock outfits Free and Bad Company. May invited him to sing with Queen at what would become the group's first gig together, Queen's induction into the UK Music Hall of Fame. Since then, Queen and Paul Rodgers have toured and collaborated together. The Cosmos Rocks marks their first official studio album together of all new material -- Queen's first since 1995's Made in Heaven, released four years after Mercury's death. 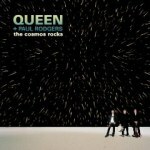 The Cosmos Rocks is equally attributed to all three members of the band with Rodgers, May, and Taylor sharing writing, performing, and production credits. Original bassist John Deacon is missing from the mix, having retired in 1997, prompting Brian May and Paul Rodgers to round out the rhythm section by taking turns tackling bass duties on the album. With the band's original member tally cut in half, some might ask why the band should even go on, much less under the name Queen. First of all, that hasn't stopped the Who from functioning -- and functioning rather well. Secondly, this isn't your (presumably, now untied) mother's Queen. This is Queen + Paul Rodgers. And it sounds like. well... like Queen... plus Paul Rodgers. Every element of classic Queen is left intact: the grandiose, theatrical lyrics and musical arrangements. The familiar, warm-toned squeal of Brian May's epic guitar riffs, a signature part of Queen's sound. The layered harmonies and multi-tracked backing vocals. The only difference is that Paul Rodgers is capably holding down vocal duties. Unlike Journey who shopped around to find several vocalists over time that could perfectly imitate Steve Perry's nasally vocal calisthenics or INXS who took their search for a Michael Hutchence sound-alike to network television, Queen didn't attempt to find some bargain basement Freddie Mercury impersonator as a stand-in. Enter Paul Rodgers to make the grand assist in resurrecting Queen with some brand new material. Rodgers' vocal range is impressive –- blues-drenched and gravelly, yet velvety smooth at the same time. Rodgers remarkably reaches bottom-heavy highs and extended notes and can drop it down into the lower register all in the same phrase (particularly on "Time to Shine"). Every word is either enunciated with pitch-perfect clarity or artfully slurred over to suit the mood of the song. While he's known for his bluesy stylings, Rodgers' vocals stretch well with what Queen fans can define as the band's classic sound. As stated before, Queen's musical formula is still firmly in place. Queen still has a sound that is distinctive, yet manages to never stay in one place for very long. The lead track, "Cosmos Rockin'", merges rock and boogie woogie with a touch of sci-fi based lyrical camp thrown in for good measure. They dabble in different styles such as reggae on "Call Me" and Santana-esque blues on "Voodoo". Just when you think you've heard it all, the newly-minted trio turns around and gets insanely heavy on "Surf's Up... School's Out", a mixture of what sounds like the Who crossbred with Alice in Chains. Queen's penchant for thought provoking lyrics has stood the test of time, as well. The politically-charged "Warboys" gives Taylor an opportunity to showcase powerful drumming that plays upon the song's thematic content. Taking on the flipside of the track's sentiment, some of Queen + Paul Rodgers' greatest moments on The Cosmos Rocks happen on the disc's ballads. "Small", its instrumental reprise, and "We Believe" are absolutely beautiful with poignant messages for peace, equality, and understanding standing against a backdrop of Brian May's majestic guitar work. Even the simplest of May's strummed chords sounds almost orchestral. There won't ever be another Freddie Mercury, so why bother trying to replace him. Although his ghost pleasantly haunts the album in some ways (The Cosmos Rocks is actually dedicated to him), Paul Rodgers breathes new life into Queen, while still keeping the band's tremendous legacy intact as they soldier forth with new material into the 21st century.